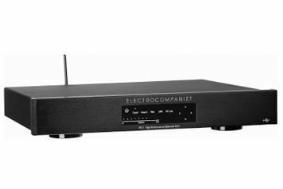 BRISTOL SHOW 2011: Electrocompaniet adds a USB DAC to its line-up | What Hi-Fi? When connected to a PC via USB the £1250 PD-1 will both stream music and control media players, giving start/stop and track skip from the remote control supplied. The conventional digital inputs can be used for TV sound, or hooking up disc players and the like. Connections include stereo XLR and RCA outputs, plus two coaxial digital inputs, one optical input, one USB and one RF link. The PD-1 supports sampling rates up to 192kHz/24-bit. A standard remote control allows the user to switch between different sources or adjust the volume if the unit is connected to a pair of active speakers. In addition, the PD-1 has point-to-point wireless capability: with the addition of an optional Media Streamer, which connects to a computer via the USB port, the DAC can connect without the need for a home wireless network.